Jamie: My color today is Essie Lapiz of Luxury. I've actually seen this one referred to as both Lapiz of Luxury and Lapis of Luxury. Essie's site has the former, though, so I'll go with that! In any case, the color is stunning. It's a creamy, opaque cornflower blue with just a touch of a smoky undertone that makes it equally as perfect in summer as it does in winter. I've been a fan ever since I saw the first ad featuring it, and buying it wasn't so much an option as it was a necessity! I wear this gorgeous color every chance I get. Essie Lapiz of Luxury retails for $8 at beauty.com. Katie: Today's color is OPI Catch Me In Your Net. This polish a complete and total glitter bomb. I love it most of all on my toes in a pair of flip-flops, preferably while sitting on the beach with a drink in my hand. In my mind, this is the color of mermaid tails. 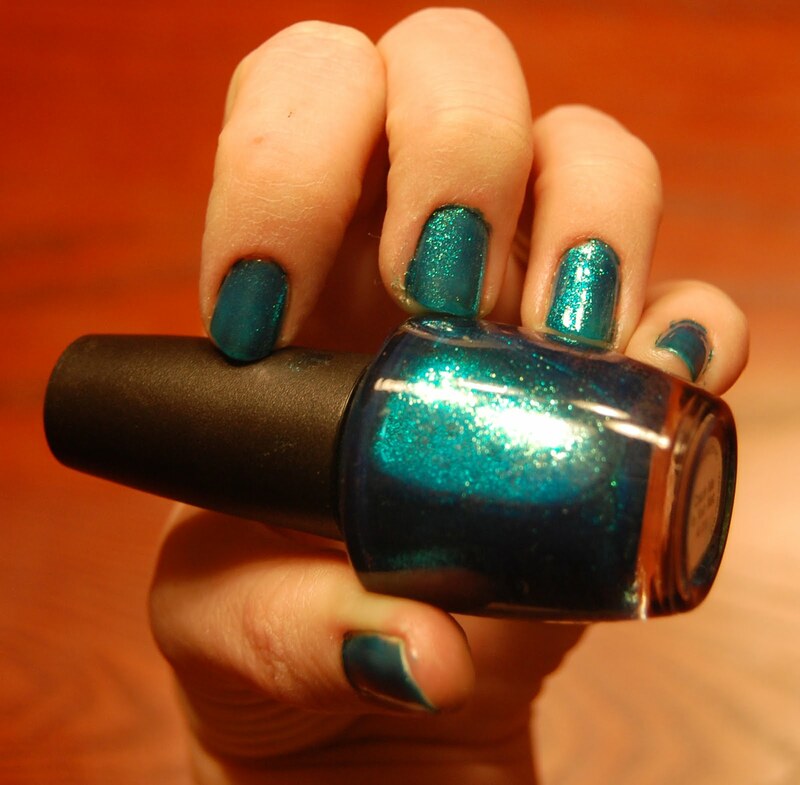 A deep teal foil glitter, it flashes gold and green in most lights, but absolutely glows in the sunlight. I need three coats to get this one opaque, and I've even heard of some people using four coats. I'm not patient enough for that, so I just apply it a little thicker than I might with another polish. But I promise, this one is definitely worth the wait. Like many glitters, it benefits greatly from a good top coat! Note: OPI Catch Me In Your Net is tough to find, unless you're lucky enough to spot it in a beauty supply store or eBay.